Sealaska Heritage Institute (SHI) has released its first Tlingit apps for students who want to learn their Native language through mobile devices. The programs include an app with more than three hundred Tlingit words, phrases and sounds and an app that teaches the Tlingit words for ocean animals and birds through interactive games, said SHI President Rosita Worl. “We know our students are learning our Native languages in new ways, and technology plays a big role in that. This is our effort to help learners revitalize Tlingit by learning the language through their mobile devices,” said Worl, noting the institute will continue to add new content through updates. The “Learning Tlingit” app includes sections on vocabulary, phrases and the alphabet. The vocabulary includes seventeen categories, including animals, fish, food, geography and plants. As users click on each category, a list of words is revealed and students can learn the Tlingit spellings and hear the words spoken in Tlingit. The phrases section includes categories for coming and going, feelings, introductions, learning Tlingit and meal time and the alphabet section allows students to learn how to pronounce each sound. The app also includes a searchable index and a link to language podcasts, which will be available soon. The app features audio by fluent speakers David Katzeek (Kingeisti), the late Johnny Marks (Kooteixtée) and Marsha Hotch (Guneiwtí). It also includes audio from Tlingit language learners Linda Belarde (Satóok) and Ralph Wolfe (Góos’k’) and linguists Keri Eggleston (X’aagi Sháawu) and the late Richard Dauenhauer (Xwaayeenák). 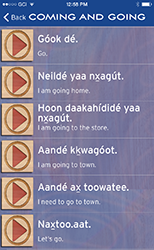 As SHI updates the app, it will grow to include audio by fluent speakers Nora Marks Dauenhauer (Keixwnéi), Fred White (Gunaak’w) and the late June Pegues (Aan Yax Saxeex) and language learner Yarrow Vaara (S’akjayéi). The materials were compiled by SHI Education Project Coordinator Katrina Hotch. Graphic designer Cika Sparck also contributed to the project. The "Tlingit Language Games" app includes two programs that teach the words for birds commonly seen in Southeast Alaska and ocean animals indigenous to the region. As the birds and ocean animals move around, users can touch them to see and hear the Tlingit words. The “Birds” game teaches the words for eagle, raven, owl, hawk, Steller’s jay, robin, sparrow and kingfisher. The “Ocean Animals” game teaches the words for beluga whale, blue whale, humpback whale, seal, sea lion, porpoise, killerwhale, squid, jellyfish, herring and ocean. Students must take a quiz to exit the game apps. Desktop versions of the games are available in the language resources section at www.sealaskaheritage.org. The audio was recorded by the late Tlingit speaker Johnny Marks (Kooteixtée) and the games were illustrated by SHI’s Media and Publications Director Kathy Dye. Both apps were published by Sealaska Heritage Institute in partnership with SERRC—Alaska’s Educational Resource Center—and developed by Wostmann & Associates of Juneau. They are available for download to i0S and Android devices at no cost. With the framework developed, SHI plans to produce Haida and Tsimshian versions in the future.